In layman terms, Minitab is a software package. It is a menu and command driven software package for statistical analysis. 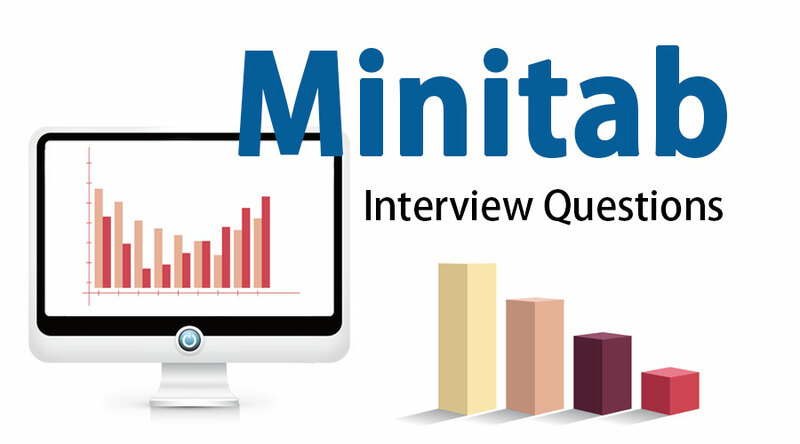 So if you have finally found your dream job in Minitab but are wondering how to crack the Minitab Interview and what could be the probable Minitab Interview Questions. Every interview is different and the scope of a job is different too. Keeping this in mind we have designed the most common Minitab Interview Questions and Answers to help you get success in your interview. 1. What is Minitab and why use Minitab? Minitab is a software package for statistical analysis. Minitab is used for both learnings about statistics as well as research in statistics. It is very useful and easy once you know the fundamentals. For the beginners, it is very easy to start with and in most of the introductory statistical analysis courses, Minitab is used. Using Minitab drop-down menu and syntax will perform the analysis of data. Minitab had a good user-friendly interface and it supports many languages. 2. How do you access Minitab? Minitab is available for the free 30-Day trial period. We have to register on the official website for getting the link to the software. After registration, we will be getting an email from the Minitab team for downloading the software. Minitab offers Minitab 18 and Minitab Express versions in the market. Minitab 18 provides a complete collection of statistics for analysis and also for teaching the beginners. Minitab Express is for learning and teaching Statistics, Probability Distributions, Regressions and more. List the file formats associated with Minitab? Minitab worksheets are similar to spreadsheets in Microsoft Excel. A Minitab worksheet file consists of all the information present in the worksheet such as columns, design objects, constants, and matrices. Sharing the worksheets without sending the whole project details among the Minitab users is allowed. Minitab organizes our work into projects, which can be opened and saved and this file is identified as .mpj. The project file contains all the information present in the project, together with outputs, worksheets, and history. When we save a project, automatically we save all our work at the same time. Minitab graph file consists of graphical output. We can edit the Minitab graphs in Minitab as well as we can send it the other users of Minitab without disclosing the project information. MS Excel (XLS, XLSX, and XML) file contains only column data. We can open and save these files in Minitab. Mac file is a text file that contains commands of Minitab and we can utilize this file to automate a repetitive task such generating weekly, monthly reports, calculations and many more. Mtb- Minitab exec is a simpler type of Minitab macro. 3. Explain some basics actions and tools required to use Minitab effectively? Calculator, Report Pad, Help topics, Toolbars. 4. Name few Data Analysis functions within Minitab? •Correlation, ANOVA, Tests on Proportions, Variance Tests, Sample Size and Simple Linear Regression and Sample t-Test. 5. Explain the Data Types in Minitab? Numerical: For Statistical Calculations, numerical data is the only type in Minitab. Numerical data is associated on the right side of the column. Numbers with commas will not be recognized by Minitab instead it will be considered as text. Text: For computation purpose ‘Text’ can’t be used. If any column contains text in it that column name/label will be changed from CI to CI-T.
Date/Time: Minitab recognizes Date and Time Data Types, but it stores them internally as a number so that we can manipulate them in future if the requirement comes. If we put D label after the column name, then it will indicate the data or time column type. 6. What are the symptoms of corrupted projects in Minitab and how to recover them? Error messages come out when we try to open the project or update any graph. Some items will miss from the project after we save and reopen the project. Sometimes a project does not seem to open and graphs that appear to be linked to the worksheet are not really linked. Try to retrieve the backup file of the project – When we open a project file, Minitab automatically creates and saves a backup file in the same project folder with a specific file format. For example is the project file is PROC.mpj then the backup file would be PROC.mpj.BAK. Try recovering individual worksheets – if we are not able to retrieve the backup copy, we can try recovering individual worksheets. Raising a support ticket with Minitab– we can send the project files to the Minitab team copy the project and the BAK file and send those to techsupport@minitab.com, they might help us in resolving the issue. 7. List the calculator functions in Minitab? Calculator menu gives many predefined functions; we can filter them by selecting the category. Available categories are Arithmetic (e.g signs function, Round function etc), Data/Time (e.g Today, When etc), Logical (e.g if, any etc), Statistics (Mean, Standard deviation etc), Logarithm (Log base, Exponential etc), Column functions (Rank, Sort etc), Text functions (Find, Concatenate etc), Row Statistics, Constants and Trigonometry (Sine, Tangent etc). When we select any functions from these categories, the function syntax will appear in the Expression box.